You haven’t been to Lucerne if you haven’t ambled along the Kapellbrücke, the world’s oldest surviving truss bridge. Built in the 14th century as part of the city’s fortification endeavours and named after the nearby St Peter’s Chapel, it crosses the Reuss River where visitors flock to snap historical buildings clad in frescoes. Unlike no other pedestrian bridge, here you’ll be able to see museum-quality, 17th-century paintings by local Catholic painter Hans Heinrich Wägmann, who depicted important Swiss events and mythology on panels under the gable roof. Its octagonal Water Tower — so named because the structure stands on, not holds, water — was at times a prison, torture chamber and later, municipal archive, but is now closed to the public. The bridge was severely damaged in August 1993, when a fire broke out probably from a cigarette. Two-thirds of the paintings were razed, but the bridge and remaining 30 artworks were reconstructed and restored at the cost of CHF3.4 million. Visit just before dusk, when the icon is at its most photogenic. Escape the modern world with a stroll through the Altstadt (Old Town) on the right bank of the Reuss River. Its well-preserved medieval core of elaborately frescoed buildings, set around genial town squares landmarked by ornate fountains, offer a fairy tale-like atmosphere. Not to miss in Kapellplatz is Lucerne’s oldest church, St Peter’s Chapel, which was built in 1178 but renovated to its present form in the 18th century. Its exterior wall still features an alabaster carving of the Mount of Olives. At Kornmarkt, meanwhile, Old Town Hall, built over 1602-06 in Italian Renaissance-style but topped by a very typical Swiss hipped roof, hosts marriage ceremonies, while the neighbouring Zunfthausrestaurant Pfistern — a recommended spot for seasonal Swiss cuisine — is the place to dine if you want views of Kapellbrücke. To the west is Weinmarkt, where Passion plays were held during the late Middle Ages, and buildings feature some of the most fascinating frescoes. Visit early in the day or a crowd-free photo will prove elusive. Lucerne’s social life used to revolve around its fountains, with housewives and servants exchanging news as they waited for their water tanks to fill. There are still 225 fountains in the metropolitan area, of which 166 are public, and all provide clean drinking water for free. The really old fountains — it is not known exactly which is the oldest though a fountain already existed at Weinmarkt in 1332 when Lucerne joined the Swiss Confederation — are still connected to an underground network fed by water at the foot of Mount Pilatus, while newer fountains are supplied with treated water from Lake Lucerne. Employees of the street inspectorate periodically check and clean every single fountain, so do the environment-friendly thing and fill your tumbler with pure drinking water that costs nothing. The fountains are all sculptural works of art that warrant a look, though if you can only visit one, get up-close views of the Neptune fountain Mühlenplatz, which holds 10,000 litres of water and is hewn from a single rock. It used to supply the city’s fire service. The Fritschi Fountain in Kapellplatz, with its painted allegoric figures, also celebrates its centenary this year. Go ahead and check in one of its luxurious residences and suites too. But really, it is the Health & Beauty centre that you’ll never forget. It offers a comprehensive menu of spa, massage and beauty treatments to help relax and rejuvenate as you are pampered with La Prairie products. Whether it’s blue skies or snowing, you’ll also want time in the heated infinity outdoor pool that looks out into Lake Lucerne and the mountain ranges. If it’s summer, take a dip in the lake — the hotel has private access. The Park Hotel Vitznau (parkhotel-vitznau.ch) also has a reputation as a mecca for wine lovers, with six cellars stocked with more than 30,000 bottles of premium vintages including an enviable selection of Chateau d’Yquem. How’s that for vinotherapy? A year-round winter wonderland, Titlis is where to get a good old romp in the snow, regardless of season. More than 80km of slopes await those who want to ski or snowboard, while a network of walking trails spans some 50km, crossing mountains and valleys. Whip up plenty of snow in a snowtube, minibob or balancer when you tear down the piste at Trübsee Snow Park or toboggan past covered forests all the way down from Gerschnialp to Engelberg. While you’re at it, take the Cliff Walk along a narrow suspension bridge at 3,041m above sea level, or visit the Glacier Cave that takes you 20m below the surface of the region’s only publicly accessible glacier. To get to Titlis, cable cars whisk you from Engelberg directly to Stand station, where the Titlis Rotair — the world’s first revolving gondola — deposits you straight at the summit. Set on a forested ridge some 500m above Lake Lucerne — where Audrey Hepburn married Mel Ferrer in 1954 and Sophia Loren once lived — Bürgenstock (buergenstock.ch) overlooks the Rigi and Pilatus mountains. So know that it is no hyperbole when friends return and wax poetic over those jaw-dropping views. 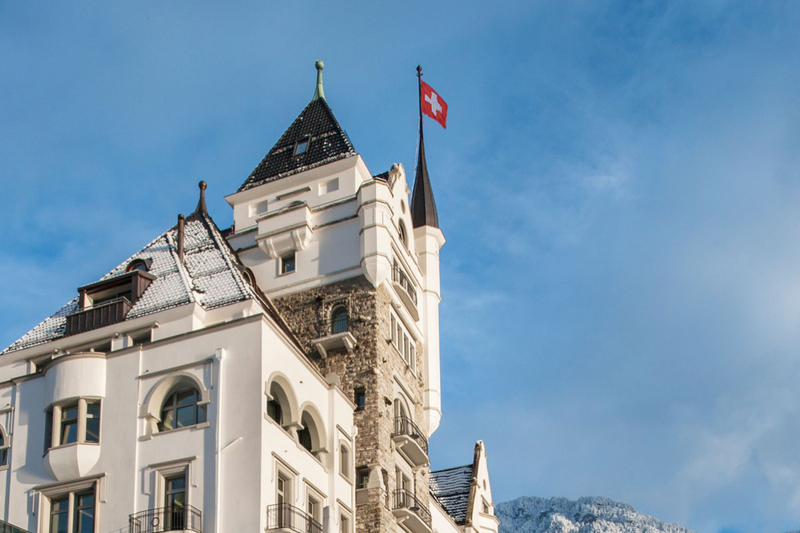 Here, four hotels, 67 residences, 12 restaurants and bars, and a 10,000-sqm Alpine spa are enveloped by woodland and meadows with 70km of hiking and biking trails, a private lido on the lake, golf course and tennis centre. Thanks to Bruno Schöpfer’s (managing director of resort owner Katara Hospitality Switzerland AG) wine passion, a few rows of vines have been planted to the south of the property, which means guests can partake in harvest and vinification. Hypochondriacs will be pleased that one of the hotels, Waldhotel, is integrated with a full-diagnostics health and medical centre, hence ideal for post-operative convalescence, treatments and check-ups.